Nippy This Morning….25 degrees right now…burrrrr ! ! ! Today is the coldest day we have had so far and it will warm up after today. The high for today will be in the mid to upper 30s. Then we go into the mid 40s and back into the 50 through the weekend and into next week. Yeah! Not quite ready for cold yet. Change in the generation pattern the past four days. Now we are getting heavy flow (three units) in the morning, usually between 7:00 and 10:00 a.m. then shut down for six to several hours during the middle of the day. Saturday, Stan took John and his son, Ryan out for half a day. They were generating a low one unit that day so they did the full float from a little below the dam down to our take out off Acacia Club Road. For this time of year, it was a good day on the ruby 2 midge. proceeded to have a very good day on the ruby 2 under the big ruby. She did leave a few for Russ. Her highlight of the day was a pretty brown trout. I must say, Russ did not have his fly rod in his hands all the time. He found the area beautiful and was taking some great pictures a lot of the time while Sheila was catching. Wednesday, Rick from Minnesota, spent a half day with Stan. Very good day for them on the lightning bug in the morning. When they stopped hitting this, he went to the P&P and the catching resumed! Other than the windy, cool day, it was a pretty good bite day! 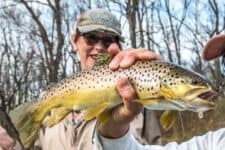 This entry was posted on Thursday, December 7th, 2017 at 10:16 am	and is filed under Fishing Reports. You can follow any responses to this entry through the RSS 2.0 feed. You can leave a response, or trackback from your own site.